The Five Keys to Winter Readiness: Is Your Roof Prepared for the Cold? Ice, snow build-up, and the cycle of freezing and thawing can punish an otherwise healthy roof. Prepare for winter so spring doesn’t reveal a roof that is in need of repairs. It is always important to have a drainage system that prevents water from ponding on the roof — but never more so than in the winter when that water can freeze. Flat roofs have one of three water-removal systems: gutters, scuppers, or inner drains. All three are dependent on unblocked openings so water can be taken away from the roof. It is crucial to clear debris to ensure that the roof’s water-disbursement system can stop water from pooling and freezing. Ice and snow — especially when densely packed — can put a dangerous amount of weight on a roof. 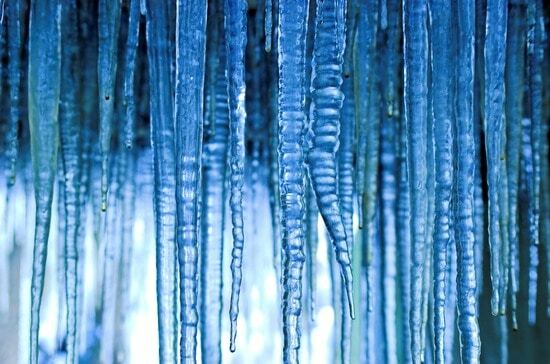 If ice dams form, they can block the openings of drains, gutters or scuppers, leaving even more water to freeze, which contributes to the already excessive weight. In extreme situations, roofs can and sometimes do collapse under the added weight. The danger of freezing water is heightened if water finds its way into small openings. As water expands and contracts, it puts pressure on the surrounding material. Like tiny potholes that become craters in the winter, small leaks don’t stay small for long once they fill with water and freeze. Building owners should repair all leaks, and schedule one of their semi-annual roof inspections before the winter arrives. The arrival of the first big storm of the season is not the time to think about snow accumulation. Have a snow-removal plan in place early. Snow removal should be handled by professionals who know that any work performed with machinery or metal-edged shovels can puncture the roof. Instead, make sure they use large plastic shovels and wheelbarrows to ferry the snow over to the edge of the roof. Clearing snow build-up on a 1 million square-foot facility is a logistical challenge. Work with a professional roofer to develop a snow-clearance plan. That plan should minimize labor costs and maximize drainage by incorporating basic irrigation principles. Clearing snow in strategically planned trenches can cut shovelling time in half and reduce the cost of the operation by up to 50%. Roofs need more attention in the winter than any other time of year. Inspections should take place before it gets cold. It’s up to the building’s owner to address any outstanding issues, remove all debris, and lay out a course of action so they’re not caught off guard when winter descends.